If you are looking for reliable and experienced remodeling contractors in Mooresville, contact us at Chad Goodin Signature Homes! 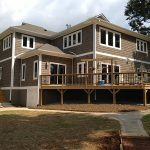 Remodeling Contractors in Mooresville & Lake Norman – We know there are a lot of remodeling contractors in Mooresville, North Carolina to choose from, so you may be wondering why you should choose us. Let us tell you why we believe you won’t need to turn anywhere else. Here at Chad Goodin Signature Homes, we won’t consider your project complete until we know you are 100% satisfied. We are proud of our exemplary customer service, and we know you will be amazed from the first contact we have with you right through the completion. Most remodeling contractors will tell you they have great service, but our 30+ years of service to the community speak for themselves. While most remodeling contractors can handle small-scale remodeling, we leave them in the dust when it comes to handling every part of the job. You won’t hear, “Sorry, you’ll have to call someone else to take care of this unexpected problem.” We are full-fledged home builders, so we are the ones others call when they run into something over their heads. As your preferred remodeling contractors in Mooresville and Lake Norman, there are several important things we do to ensure that your vision comes to life. We Get to Know You – We wouldn’t be doing our job if we didn’t take the time to get to know what makes you excited about your home. Only after we nail down the most important details of your remodeling project will we begin working to bring about the best changes. General Contracting – As general contractors, we can handle every aspect of your project from beginning to end. There won’t be any coordinating of multiple contractors on your part because we’ll take care of those details on your behalf. We have plenty of connections to make sure the work is done right during home remodeling. Budget Friendly – We understand that every family has a different budget, and we’ll never try to outprice you during your remodeling project. We offer reliable quotes, can recommend the ideal finishes and fixtures, and will help you stay within your means, so your home remodeling project is a complete success. This is crucial to our success as your remodeling contractors. Like Family – Once you’ve worked with our team, you’ll quickly see that we treat you like family and you’ll always be a part of ours. We want you to feel like your home is the best one on the block and that you can rely on us any time you have a remodeling project that needs to be completed. We offer you the perfect blend of quality, dependability and affordability. Our design services will get you the best quality possible while being affordable, and you can depend on our superior workmanship and disciplined project management to get the job done right the first time. We are an Angie’s List top-rated builder for a reason – we build your dreams! Let us build your dream home or improve and modernize the one you have. At Chad Goodin Signature Homes, our remodeling contractors proudly serve Mooresville, Cornelius, Davidson, Huntersville and the surrounding Lake Norman area of North Carolina.